Peanut Butter Nuggets – 12 oz. Patsy’s Peanut Butter Nuggets are a winning combination of milk chocolate and peanut butter taken to exquisite extremes. 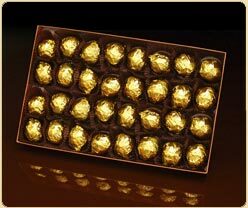 The finest creamy, smooth, pure peanut butter fills luscious milk chocolate shells shaped like gold nuggets. Individually wrapped in gold foil. Patsy’s Peanut Butter Nuggets are a winning combination of milk chocolate and peanut butter taken to exquisite extremes. The finest creamy, smooth, pure peanut butter fills luscious milk chocolate shells shaped like gold nuggets. Individually wrapped in gold foil. Fine handmade chocolates always make the perfect fine chocolate gift.